CHAPTER 2 OF THE WALKTHROUGH CONTINUES AS VELVET AND HER PARTY MAKE THEIR WAY TO THE SAVIOUR'S THRONE TO STOP ARTORIOUS. THE STATS INDICATED HERE WILL BE UPDATED AS WE GO ALONG. 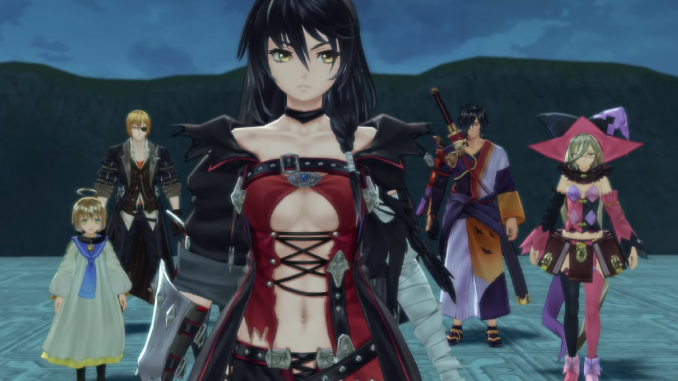 Chapter 2 of the walkthrough for Tales of Berseria begins as Velvet and her party arrive at Zexon Harbor after escaping from Titania. She plots on exacting her revenge on Artorius after hearing word of a way to get to him in the Saviour’s Throne. Upon arriving at Zexon Harbor, Velvet tells Eizen that they won’t be going to Titania, despite Eizen’s intentions. She assures him that Captain Van Airfread is alive, but was kidnapped by an old man called Melchior. Walk ahead for another conversation with Eizen. Then, talk to Benwick. You can send the ship to explore locations in which you will be able to obtain items. This can be done from the menu. However, the exploration will have a time duration. This is useful for obtaining various kinds of items such as ingredients, weapons upgrades and attachments. Walk around the area. A Katz holding some balloons can be found on the other side of the stairs. The Katz lets you to play some mini-games where you can win attachments and the Normin outfit if you get a high score, or trade them for TL coins. Proceed north and look for a man with a “!” above him. Then, go further north to the docks. One of the docks has a Katz Box where you can spend 75 for a Katz with no attachment. From there to the east, there will be some boxes with cats on them. A chest nearby will contain Life Bottle. Then, go south. The merchant that Eizen talked to from before will have a “!” above him. Then, proceed to the food stall and talk to another man with a “!”. Afterwards, get the Denole Bottle from the chest behind him. Go south into the last area. Once there, go up the stairs. Somewhere around it is a chest with 720 Gald. Then, go in the Inn and talk to the man at the bar. An item shop nearby sells Calcite gear. You can get a Calcite Blade in a chest located west near a building. Then, head to the exit to the south to Danna Highway. As you come to Danna Highway, run along the path ahead. Near the east wall is a chest containing a Calcite Vest. Then, head for the exit to the lower east. In the next area, head to the south to obtain a Chamomile near a tree. Afterwards, proceed north to find a Kats Box which requires 95 Katspi to open. It will contain a Katz and a Silk Hat. Head back and make your way to the south exit. A conversation will ensue along the bridge. Then, proceed to the area in the middle of the map going north, then make a right that leads to under the bridge. Pick up a Katspi and look for a chest containing an Earth Ring. Afterwards, go north east. There will be a tree with more Katspi as well as a chest containing 750 Gald. Walk to the exit in the lower east to arrive at a soldier’s outpost. A Rosemary can be found somewhere along the exit. From there, proceed to Rogress. After arriving Rogress, walk east to a chest containing 800 Gald. First, talk to the old man with a “!” on his head, and then the girl nearby. Afterwards, proceed south into the next area. Once there, go near the fountain and talk to the girl with a “!” nearby. Walk around until you find the item shop where there will be chest behind it that contains a Calcite Garment. There will be a ladder nearby that you can climb to find a Katz Box. To open it, you’ll need 95 Katspi. This will give you a Katz. Climb down and head to the castle entrance to the south. Here, a cutscene will ensue. After the cutscene, pick up a Holy Bottle south of where you are. Then, head for the flight of stairs and under the tree to obtain a Verbena. Afterwards, go to the Inn. Inside, examine some books near the door to trigger a conversation. Then, head out and return to the first area towards the “!”. 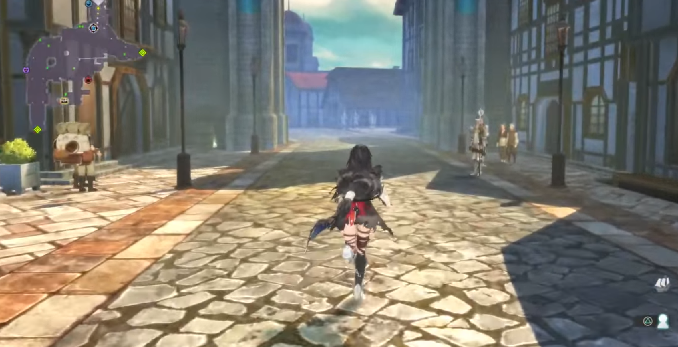 Next, go back into the capital’s main plaza and go inside the tavern. There, talk to the man at the bar. Here, a mysterious woman will appear and will ask you to do some job for her. You need to complete them all for her to let you in on some piece of news. From here, take the first job. 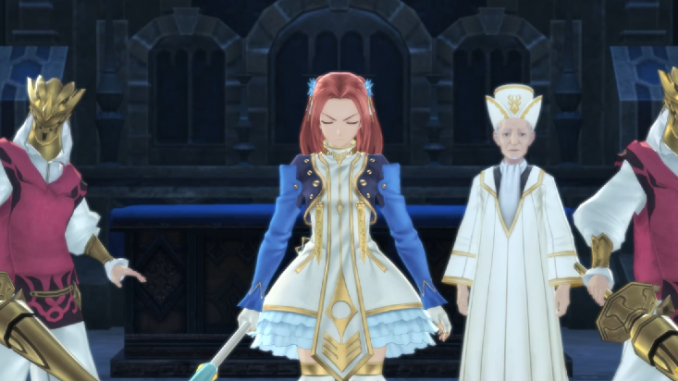 If you have time, you can try to do the waiting mini-game which will reward you with a waiter outfit for each of your characters that have completed them. Head out the tavern and go back to Zexon Harbor. Just outside of the capital’s entrance will be a woman who asks you to kill a gouma for The Abbey. You will also obtain 2x Inofle Bottles. Upon reaching Zexon Harbor, you will need to go north. There will be a storage room. Head inside and check the chest to get an Amber Fragment . Afterwards, approach the red crates and light them up. Exit the building to fight Eleanor. Using Fire-based attacks are good against Eleanor. Earth-based ones are not advisable to use since she has good resistance against them. For the Sword User, use Water-based spells. It is resistant to Wind. After defeating them, return to the tavern in Rogress to report the success of the first job. There will be two more jobs to complete. One involves going back to Danna Highway and heading towards the gold star you saw by the bridge earlier. There will also be more red crates there. Defeat the gouma then return to the tavern. For the last job, head to Danna Highway again and go to the north path in the middle that was inaccessible before (the one sealed by the Exorcists). As you go along in the new area, you will catch a glimpse of a daemon across the map. From there, walk along the east wall and across a plank. There will be a Saffron near some boulders as you make your way further. Then, head for the left exit to come to Gallis Lake Road. After arriving at Gallis Lake Road, proceed east and jump up the big rock. Then, set the roots alight and push them into the lake. You occasionally encounter a wandering enemy in the area. It is weak to Fire and resistant to Normal and Earth-based attacks. Proceed south to obtain Katspi. You can try going up the mass of rocks further south to find more Katz. Head for the south exit.Once in the next area, go south again and ignite the roots. Then, knock down the huge rock and jump across to collect Katspi, and a chest containing an Aqua Ring at the farthest section.Next, go back and go up another south platform where Katz Box will be. To unlock it, you need 75 Katspi. The box contains a Katz and an Angel’s Halo. Make your way back to the previous area and head to the north exit. Here, there will be a giganto that moves about in the area. Before engaging the enemy, jump along the rocks to the west part of the map to find some Katspi. The enemy is weak to Water and resistant to Wind, and likes to cast Fire-based attacks. Once you have defeated it, you will be able to access Evil Mode. Proceed to the south portion of the map to find Calcite Boots, then head for the south exit. In the next area, you can jump up some rocks to reach a chest containing Holy Bottle. Afterwards, return to the previous area. You can choose to continue north to gather more Katspi, then go south where the gold star was. A cutscene will play. Then, you will encounter two hirelings that are able to call snake-like female spirits. Afterwards, proceed to the back where some guys will be. This will conclude all the jobs required for you to do. On the other side of the area, there will be a giganto with a “!” that you can engage. The enemy is weak against Wind and resists Fire and Water spells. There will also be some Katspi to collect if you continue around the area. If you jump on the rocks, there will be a chest containing Denole Bottle. Then, head back to Rogress and report the job. Still in the tavern in Rogress, get to the Item Shop and go upstairs. There, you can find a chest that contains Simple Pendant. A cutscene will play while inside the tavern. While you will find out Artorius’ next destination, he will be protected by a magic barrier. To be able to obtain an item to get through the barrier, you need to do another job: To murder High Priest Gideon. After the cutscene, talk to the mysterious woman who has revealed herself as Tabitha Baskerville. If you managed to defeat the Ekidona, the Orc King and the Bat Baron, you can talk to the girl by the exit (she will have a monster icon above her head) to receive somewhere around 4700 Gald. If not, talk to the innkeeper and go to sleep. Some cutscenes will play. After you wake up, exit the building and head to the east exit. As you come to the church square, climb up the first set of stairs to find a Life Bottle in a chest. Then, go down and talk to the guild member disguised as a soldier to gain entrance to the Rogress sewer. After a cutscene, proceed south and then exit to the path to the right. Follow the path to a Verbena, then head back. From the first area, head to the exit blocked by a large rock by destroying the obstacle in the way. Follow the path to find a chest containing an Apple Gel, then head for the next area. From there, head to the exit on the upper left by breaking another huge rock. You will come across a Life Bottle and some Katspi. When you get to the small hole, enter it to engage an daemon. Wind-based spells are good to use against the enemy, while earth is not. After defeating the enemy, get out of the hole and return to the previous area. Go south and find the switch that will lower the water in the area. Further south is a Wind Ring, so be sure to grab it and head back to the last area. Then, proceed west. Up the flight of stairs is a Katz Box that contains a Katz. You need 65 Katspi to unlock it. You can proceed to the far south to obtain some Katspi. Afterwards, head for the exit to the southwest of the map. In the next area, go north to obtain a Lavender, then proceed to the exit to the south. You will come to a room where you will find a Calcite Fragment inside a chest. Grab it then return to the previous area. There will be another switch there that will alter the water again. Next, go west, then north. You will find a Life Bottle and another switch that you need to press. Finally, head south and gather some Katspi. There will be a small passage that you can squeeze yourself into. Crawl inside and make for the ladder that goes up, then continue on the path. There will be 880 Gald inside a chest along the way. At the end of the area, go up the ladder again to reach Rogress Palace. Once inside the palace, a cutscene will play. Afterwards, exit the room. In the next area, there will be a guard to the south, and Katspi that you can collect. Proceed along the path and into the very first room. Inside, you will obtain a Panacea Bottle. Head back and make your way to the door at the end. Moving forward, go inside the next door to get Rosemary. Once along the hallway, do not go to the door across the save point just yet. Instead, head to the door to south to obtain a Wind Ring. You can also obtain a Saffron at the end of the hall. Return to the door across the save point and go inside. From there, make your way to the door on the other side. You can obtain Katspi along the outside of the pews. Then, make for the gold star where Eleanor will intercept you. She’s a bit stronger this time around, but still quite easy. This time, Eleanor will be weak to Water. The Sword User is weak to Normal and Water attacks, and resists Wind. A good strategy is to deal with the weaker enemies first, then take on Eleanor last. In the middle of the fight, a cutscene will ensue. Afterwards, Magilou will join your party against Eleanor. After another cutscene, head back to Rogress tavern. Talk to the girl with the monster icon above her head again to receive 1950 Gald (if you managed to defeat the Pillbug). Then, talk to Tabatha. Then, if you want, you can take the time to get some information in town from different people with “!” above their heads. One will be a dog near the castle proper, another dog and a woman north from the item shop, a passerby near the church’s exit, a dog by the in the north area of town (lower east), a man near a carriage, a man on the west part of town. Afterwards, make your way again to Zexon Harbor to the ship and approach the man with a gold star. Then, climb up the stairs. 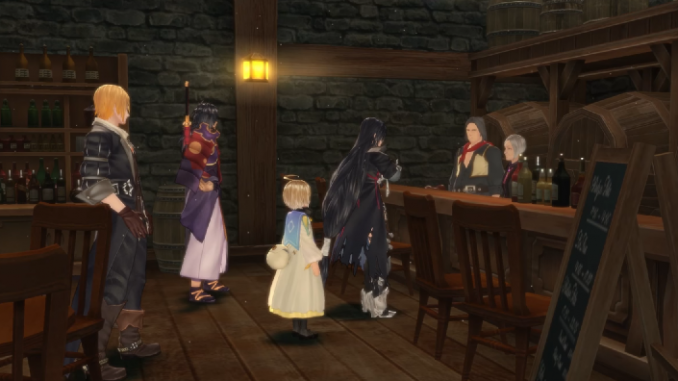 Next, go to the inn for a conversation to ensue, then talk to Magilou, then Laphicet near the Katz Box. 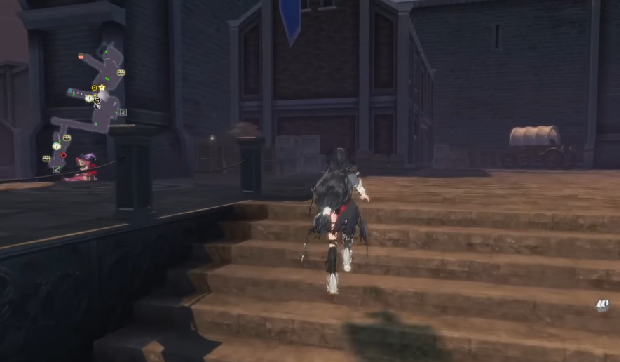 After a few more events, Eizen heads out alone so you need to follow him to Danna Highway. Once there, take the path north up the hill for a Life Bottle, then go to the location of the gold star and prepare for a battle. 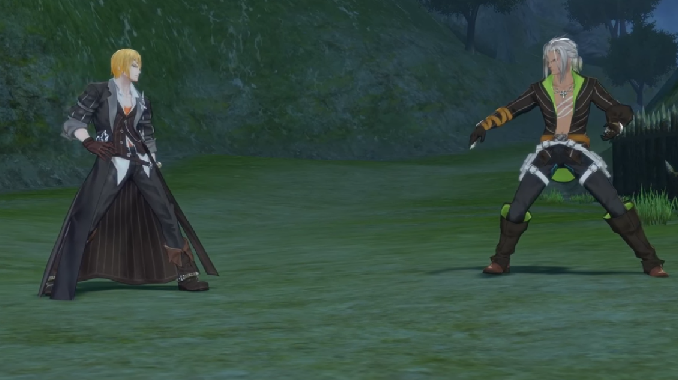 A good strategy is to deal with Zaveid, then Eizen. After the battle, follow the path ahead. A cutscene will ensue. Once in the next area, proceed to the symbol emitting light and interact with it. This will cause the barrier to dissipate. Then, go to the path on the northwest and climb the ladder to come to a chest than contains a Burning Charm. Continue along the path. Once you reach the weird symbol, interact with it to weaken the barrier. Then, look for a ladder nearby that can be pulled down, then go down. Then, proceed north. Make you way to the northeast. Along the north section you can find Katspi, then head for the ladder that goes to the upper level by going south of some columns. On your way up, you can get Katspi, then make for the shorter north passage for more Katspi and Burning Charm in another chest. Then, head for the grassy section. From there, go south to find a huge rock that has a chest behind it that contains a Panacea Bottle. Proceed again on the way north to completely dissipate the barrier, then move to the passage next to it while picking up some Katspi along the way. Then, drop down from the ladder and return to the main area at the center. Finally, go up the stairs and grab the Lavender as you make your way up. Continue following the sets of stairs to collect Katspi and Cluster Ripper. Continue following the path until a cutscene begins. Artorius 60 45480 ? ? The fight is actually scripted, so it is not worth putting any effort into. A cutscene will begin, and you will be transported to a strange area. Then, move forward and use the orbs to go to the next areas until you get to a gold star. More cutscenes will play. © 2010 - 2017 BANDAI NAMCO ENTERTAINMENT S.A.S.